The 1974 Topps Baseball card set is comprised of 660 cards. It marked the first time that Topps released their annual baseball card product in its entirety as compared to several series throughout the baseball season. The primary reason that Topps adopted this new release schedule was to prevent their baseball card products from competing with their football card releases. Sales of later released baseball cards, always suffered with the advent of the football season. In hindsight, its surprising that it took the company over 20 years to realize this fact and change accordingly. 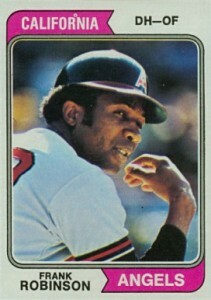 1974 also marked the first year that Topps sold a complete factory set. It was available exclusively through the JC Penny's department store catalog. A bonus to purchasing the set was the inclusion of the first ever "Traded" set, which contained 44-cards of players who had changed teams at some point during the year. 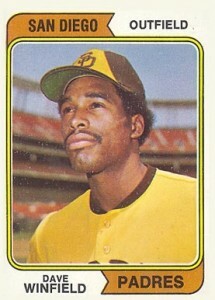 The key rookie card within the set is that of Hall of Famer Dave Winfield (#456). Other notable rookies include, Ken Griffey, Sr. (#598), Bucky Dent, (#582), Frank Tanana, (#605) and Dave Parker (#252). Anchoring the veteran checklist are Hank Aaron, (whom actually occupies the first six cards on the checklist), Pete Rose (#300), and Nolan Ryan (#20), along with a host of other future Hall of Fame players. Also of note is that the 1974 Topps Baseball card set contains the final regular issue cards of Hall of Fame players, Luis Aparicio (#61), Orlando Cepeda #(83) and Al Kaline (#215). Topps distributed the cards in numerous packaging options and price points. Collectors had their choice of wax packs (10c), cellos (25c), and rack packs (39c). Vending boxes containing 500 individual cards were also available to retailers and distributors. Measuring the standard 2-1/2 by 3-1/2 inches, the white bordered cards feature colored pennants on opposite corners of the top and bottom edges of the card fronts that house the team city and nickname. Also appearing on the front of the card is the player's name and position, filling the space in the remaining corners. The result is a very sharp presentation with a clean look that accentuates the color photography. The card backs contain the customary biographical and statistical information with the color scheme being green and the natural grey color of the card stock. An anecdotal cartoon is also included on the back with a comical quotation. Prior to the start of the 1974 MLB season it appeared that the San Diego Padres were going to be relocated to Washington. As such, the initial production run of 1974 Topps Baseball cards featured Padres players as playing in Washington, for the National League. The plans to move the team fell through at the last minute, forcing Topps to make some quick revisions. All subsequent production runs were printed with the corrected team information. As a result the 1974 Topps Baseball card set is considered to have 18 variations, which brings the master set count to 678 total cards. 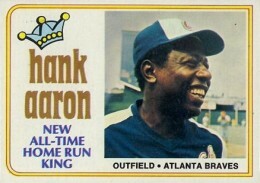 The Topps Company printed two ancillary products in 1974. The first were the scalloped cut Deckle Edge cards. Printed in over-sized black and white, the cards measure 2-7/8 by 5 inches. The front of the cards featured a blue facsimile signature. Consisting of 72 total cards, the checklist is dominated with star players of the era including Bob Gibson (#3), Tom Seaver (#9), and Pete Rose (#16) to name a few. The second was a set of 240 stamps that were randomly inserted into the regular packs. They are tough to find, in any condition, although uncut sheets do exist. Even tougher to find are the albums that were available at the time to house the stamps. 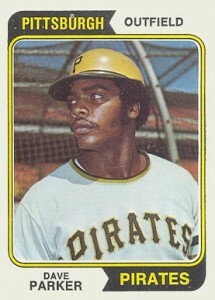 The 1974 Topps Baseball card set forever changed the baseball card landscape. The single series format made it easier to collect the entire set. 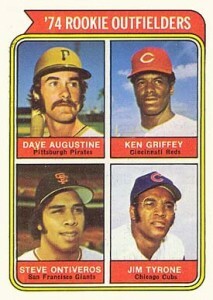 A classic design, a few key rookie cards, and plenty of stars, makes 1974 Topps a fan favorite. 1974 Topps #300 Pete Rose Reds LOOK !! 1974 Topps #20 Nolan Ryan Angels LOOK !! 1974 Topps Tom Walker – #193 PSA 10! Expos! 1974 Topps Pat Kelly – #46 PSA 10! White Sox! 1974 Topps Ike Brown – #409 PSA 10! Tigers! 1974 Topps Willie McCovey #250. SGC 88 NM MT 8. San Diego Padres. Gives me all the information I am looking for in one location. I like the 1974 Topps set much better than I like the 1973 set, which might have been the worst-looking Topps set of the 1970’s. The 1974 set might not have been as interesting as the 1971 or 1972 set, but it is a rather colorful set. I managed to complete the 1974 set sometime in the 1980’s, when old cards were considerably cheaper then.